Here is the eagerly (?) awaited conclusion to February’s story of the Seventh Crusade’s Battle of Mansurah. 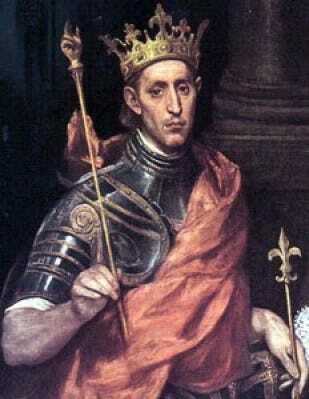 When last we left our plucky yet doomed Crusaders, under the command of the very willing but not really able Louis IX of France (d. 1270), they’d suffered a decisive defeat at Mansurah and were sent scrambling back across the Nile and from there back on north to Damietta, their Egyptian base of operations. The Ayyubid ruler, Turanshah (d. 1250, but in this case that’s not a spoiler–well, not technically anyway), had by this point assumed direct command of his army, and though it was still on the opposite side of the Nile from the Crusaders, he’d dispatched a force downriver (which, this being the Nile, means north) to block his enemy’s retreat. With all due respect to the future Saint Louis, his Crusading career doesn’t suggest much in the way of great battlefield acumen. But it must have been apparent to him that his (and his army’s) proverbial goose was cooked. That seems to me to be the only way to make sense of the fact that he kept his army encamped, stationary, for almost two months, despite lacking the supplies (or supply lines) it would take to sustain that kind of deployment. His choices at this point were: 1) wait, admittedly while starving his army to death, and hope for some unexpected event–perhaps the unpopular Turanshah’s mamluk soldiers might kill him?–to save them, or 2) march out to certain defeat. Louis opted for the former, but just to keep things interesting he let Turanshah know that he was now willing trade Damietta for Jerusalem, a course of action that he and his generals had considered and ultimately rejected after they had captured Damietta in the first place. This was the same offer that the Ayyubid Sultan al-Kamil (d. 1238) had made to the Crusaders of the Fifth Crusade, which they’d rejected before being totally defeated, but Turanshah wasn’t having it. He knew how desperate Louis’ situation was, and that this offer was a bluff. The actual “Battle” of Fariskur probably wasn’t much of a battle. On the night of April 5, when it was clear that the Crusaders couldn’t keep waiting for some act of God (which they would have meant literally) to save them, Louis ordered his men to break camp and make a beeline for Damietta. They managed to get to Fariskur, about halfway to their goal, before further forward movement became impossible. On either April 6 or April 7 (I’ve seen both in secondary literature, but I’m going with April 6 because I feel like it), Louis surrendered his army–or whatever was left of it–to the Ayyubids. Turanshah executed pretty much every Crusader who wouldn’t fetch him anything in ransom. The rest, including Louis, he took prisoner. He finally agreed to release them in late April, in exchange for a hefty tribute payment and the return of Damietta. All of them, that is, except Louis, who was to remain in Ayyubid custody until his ransom was paid. Then a funny thing happened. You know how Louis had been hoping that the mamluks would assassinate Turanshah, and that the resulting chaos would save his army? Well, it was too late to save his army, but those mamluks did assassinate the hell out of Turanshah on May 2. It seems that Turanshah had his own cadre of personal slaves (the word mamluk is one Arabic word for slave) that he preferred over the “Bahri” cadre of mamluks who dominated his army at the time. So the Bahris, led by the mamluk officer Baybars (who had a real penchant for assassination, as it turns out), decided to kill Turanshah, wipe out the by now bottomed-out Ayyubid Dynasty, and take control of the sultanate for themselves. The Mamluks, now a dynasty unto themselves, had bigger fish to fry (having just committed a coup) and were happy to let Louis go after only half his ransom had been paid (though he was still technically on the hook for the other half) and Damietta was handed over. Our story isn’t entirely over yet. Now free, Louis decided not to return to France right away. He declared that he would personally go to Jerusalem to see the condition of the Christians living there and try to help in whatever (obviously non-military) way that he could, and he also refused to leave the Middle East so long as the Mamluks were still holding many of his soldiers prisoner. So he arrived in Jerusalem and, amazingly (considering he had no army of which to speak), spent the next four years as the de facto ruler of the Latin Crusader kingdoms (the actual, albeit disputed, King of Jerusalem was still the Hohenstaufen German Emperor Frederick II, followed upon his death by his son Conrad II and then his grandson Conrad III). We have pretty good evidence that Louis was a lousy general, but he appears to have been a fairly good, or at least well-respected, king. Though he had no claim to any title in the Holy Land, he nonetheless held power based on his own personal charisma…and his willingness to pay out of his own pocket to improve the fortifications at the various Crusader strongholds in the area. Just having him there was enough to tamp down the internal dissension that was always threatening to tear the Latin kingdoms apart. Lucky for Louis, the Mamluk coup caused the remaining Ayyubids in Syria to go to war with the new Mamluk rulers of Egypt, and both sides tried to bring Jerusalem into their camp. 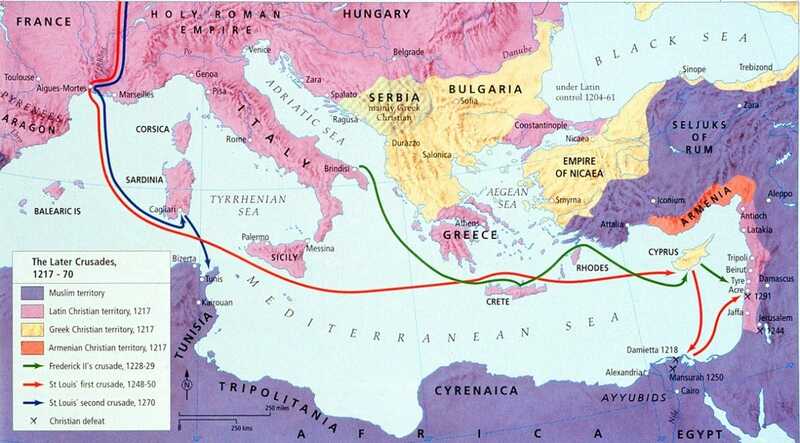 The Mamluks offered to cancel the rest of Louis’ ransom and to release their remaining captives, which seemed like a pretty sweet deal, so in 1252 Louis and the Crusaders allied with the Mamluks. This gave him wide latitude to rebuild fortifications in places like Jaffa, Saida, and Acre. It’s very possible that the Latin kingdoms, the last of which (Acre) fell to the Mamluks in 1291, would have collapsed decades sooner than they did had Louis not come around when he did. Louis finally returned to France in 1254. Although the military portion of his Crusade had been a bust, the Mamluk takeover of Egypt–an event entirely outside his control–allowed him to escape relatively unscathed and even make some positive contributions to the Christian kingdoms in the Holy Land. His next Crusade, the Eighth Crusade, wouldn’t go nearly so well.